Earlier this week I submitted final grades for the four classes I teach. It's been an excellent semester, yet the end is always coupled with exhaustion and, too often, an immune system collapse. Somehow, blessedly, my body holds out for fifteen straight weeks during the semester as students cough on me and hand me papers while announcing that they have bronchitis, and pink eye, and might be coming down with mono. But then we reach finals week and, traditionally, my body says, "Enough. You've done enough. I'll be shutting down now." This year has been no different. For the past several days I've slumped around my house wearing sweats, wrapped in a blanket, carrying a box of Kleenex, evaluating final projects, and warily checking my email in case any students are distressed over final grades. I'd much rather be healthy. I'd much rather be preparing for Christmas or proactively working on my spring syllabi. I'd much rather have clarity of mind and the ability to breathe through my nose. But, in another way, my current state is also perfect to write about what I want to share today, which is a book written by Christine Carter, my online friend, called Help and Hope While You're Healing. Although I've never met Christine in person, we connected several years ago through blogging. I've always been struck by how her writing, whether a personal email message or a comment on Facebook, exudes enthusiasm and encouragement. Simply put, Christine Carter is someone you want in your corner, and her book, Help and Hope While You're Healing, is specifically written to be in your corner when you're going through the hardest of times. 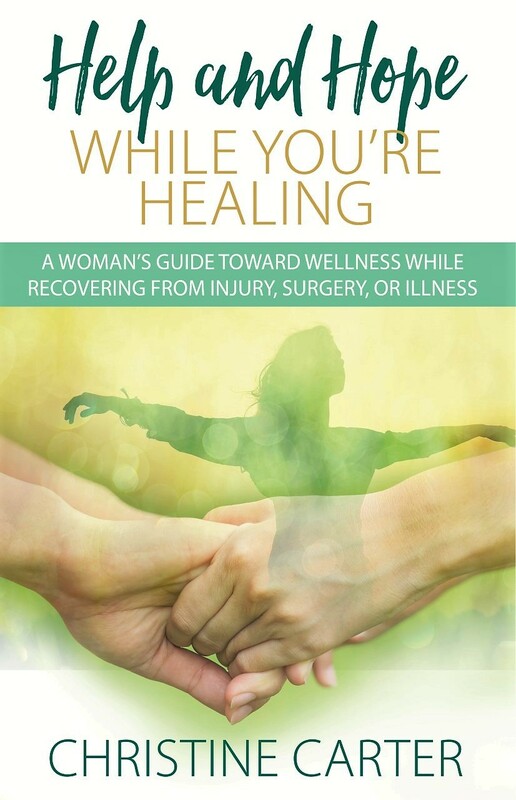 While I wish this weren't the case, Christine was able to write this book with such credibility because her own health resume is marked with multiple challenges, among them a lumpectomy of a parotid tumor, a double mastectomy, and multiple painful foot and ankle surgeries. In spite of it all, Chris retains her larger-than-life humor and positive outlook. As a person who's muttered a bit about my bad cold this week (and, if I'm being entirely forthright, on more than one past occasion, I've been convinced that I was dying while in the throes of the stomach flu, that Jesus was seriously coming for me), I've been intrigued with Christine's graceful way of coping with circumstances that aren't graceful at all, circumstances that could bring out the worst, not the best, in someone. And that's what Help and Hope While You're Healing does. In its brief format with personal examples and practical strategies, this book offers perhaps the biggest encouragement that anyone who's suffering most needs to cling to: you're going to get through this. She writes, "Some things need to be broken, opened, and taken apart to let light in." If you know any woman who feel like their health has been broken, opened, and taken apart (or if this speaks to your own circumstances), I hope you'll consider having Christine's words shine some light and hope into that void. Check out Christine's book on Amazon or visit her blog The Mom Cafe. Above all, be well! OH MY GOSH ROBIN!! Oh friend, you are SUCH A DEAR. To think how busy you have been, how sick you are (hoping a bit better?) and how much you have on your holiday plate (hee hee)- I'm just SO surprised to read this beautiful review. You are so generous, so kind, and I'm incredibly grateful for you. Thank you thank you thank you. I just can't believe you took the time and energy to do this. God bless you, dear friend. I pray you get well in time to wrap up the semester and celebrate the holidays. I'm so glad it was such an excellent semester for you! You're amazing. Awww, Christine, you're making me blush. Truly, this was my pleasure to write. God bless you too, my friend. I love Chris so much and I seriously need to get this book. She is a beautiful person and such a tremendous writer... I'm sure her book is stellar. Wishing you a speedy recovery (I'm sick too - I think it's because my body knew we were done homeschooling for the fall term). BOO! That's entirely it: your body recognizes that you're done for the term/semester and then it promptly shuts down, which is cruel indeed. I hope you feel better soon, too!